During the pre-European era, Texas was mostly comprised of many different Native American tribes. 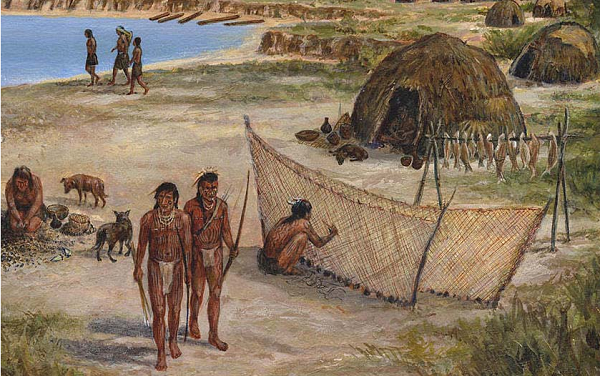 In the 1500’s, Spanish explorers came to the area, but not many people settled there and it was not heavily populated, due to the “hostile natives”. After the Mexican War of Independence from Spain in 1821, Texas became part of Mexico. Mexico allowed immigrants from the United States and native Mexicans to populate the area, which eventually led to tension, battles, and Texas independence. Texas was later annexed into the United States in 1845 and borderlines were established after the Mexican-American War. As you can see, Texas has a very long and rich history. The history of the roads is just as rich. Many of the earliest roads in Texas were developed from early Native American trading trails and the trails of the Spanish explorers. They were developed out of necessity, in order for individuals to travel from Mexico to San Antonio and the various missions throughout the state. Throughout the long history of Texas, there have been many different means of travel. In early history, the most common and innate mode of transportation was walking by foot (of course! ), but after that, the main means of travel was by horseback. Horses have been domesticated for centuries and are easily trainable, so they are naturally man’s second best friend. They are such strong and fast creatures, allowing them to gallop into the distance for hours. There is a reason we judge a car’s power by horsepower! In addition, they can carry a sizeable load and endure all sorts of terrain, making them perfect for cross-country travel and trading. They usually travelled along game trails and over time, these trails had to be widened to prevent traffic among the travelers, which was the basis for early highways. Horses are still often used today on farms and for horseback riding for fun. Horses also have a great capacity for towing, which led to the horse & buggy, horse-drawn carriage, or horse-drawn wagons. Originally, when carriages were developed, it took multiple horses to pull the carriage, as the wood alone could be very heavy. As lighter woods became more readily available to make the carriages, only one horse was required to pull the load. The horse-drawn carriage was a great advancement for society, as it allowed a whole family or small group to travel with only the use of one horse. Some carriages were very simple, while those individuals that were more well off had very fancy and ornate carriages, just as it is today with cars. During this time, the roads were mainly dirt roads or cobblestone. The next advancement on the roads were bicycles. Bicycles were originally invented in the early 1800’s and they gave people a lightweight, relatively cheap, and efficient means to get around. For those that could not afford a horse or a horse-drawn carriage, a bicycle would be the best option for them. Anybody can learn to ride a bike, young or old, and they could get around town relatively quickly with just their own leg power. During the this period in history, dirt roads began to be replaced more and more by tar roads and pavement, making way for more modern roads. Next up is the automobile. The first gasoline-powered combustion engine car was created in the late 1800’s for the transportation market, but at the time, it was only considered a toy for the rich. It was not yet attainable to the mass public until Henry Ford mass produced the Model T, which was meant to be an economical car for the average American. In its first year of business, they produced 1700 cars and by 1920, Ford had sold over 1 million cars. As all of us who have ever sat in traffic know, cars are everywhere and they are not going anywhere anytime soon. Going back to Texas’ history, the oldest and most frequented road of the past was the Old San Antonio Road, which was previously one of the old Spanish missionary trails. It was frequented by horseback riders, carriages, and wagons. Today’s roads and highways are much busier and filled with cars and motorcycles, the busiest of which is the I-35 in Austin, Texas. On that stretch of highway, a typical 30-minute commute turns into 150 minutes during rush hour, so alternative routes are recommended or find a bicycle to get around!